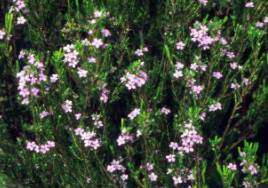 An aromatic, evergreen shrub covered with masses of starry pink flowers in winter and spring. Coleonema pulchellum is an erect, evergreen shrub and reaches a height of 0.8 to 1 m. It forms a single stem at the base, from where numerous slender, erect branches grow. The leaves are aromatic and needle-like and about 4 to 5 times as long (8-10 mm) as broad (0.8 mm). The petiole is 1 mm long and the teeth at the leaf tip point upwards. The flowers are solitary, terminal on short branchlets or axillary on reduced branchlets, often crowded towards the tips of the branches. 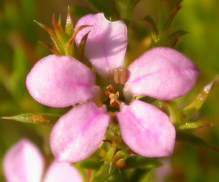 The flowers are pink, often white and star-shaped (7 to 8 mm in diameter), have 5 oval petals, 5.0-5.7 mm long, each marked with a distinctive central vein. The entire bush is covered with flowers from autumn until spring (May to October), attracting bees, butterflies and other interesting insects to your garden. The fruit consists of a 5-chambered capsule, 5.1 x 4.5 mm, dotted with glands. There is one shiny black seed per chamber and it is 2.8 to 2.9 x 1.5 mm. Coleonema pulchellum is not threatened. 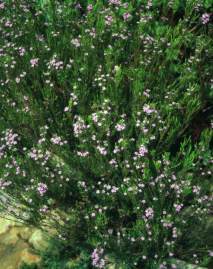 Coleonema pulchellum is found growing along coastal flats from Knysna to Port Elizabeth. It occurs naturally from sea level to 150 m. It flourishes along the coast and elsewhere. It is wind resistant and can tolerate mild frost. The genus name Coleonema is derived from the Greek koleos meaning 'a sheath', and nema meaning 'a thread or filament'. Pulchellum means 'pretty' in Latin. Burchell collected the first specimen of this species in December 1813 in Algoa Bay. 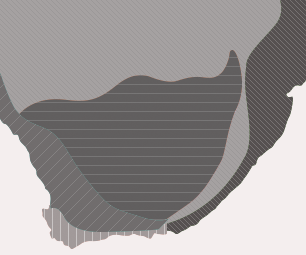 There are 8 species found in this genus and they occur from the Western Cape to the Eastern Cape. Coleonema album, commonly known as the Cape May (Eng.) or Aasbossie (Afr. ), is an excellent plant for coastal gardens bearing white flowers. Fishermen remove the odour of bait from their hands by rubbing the aromatic leaves. Coleonema pulchrum, the Langeberg Confetti Bush, and C. virgatum, which bear pale pink or white flowers, differ from C.pulchellum in having longer leaves, and bigger flowers. Coleonema aspalathoides, has bright pink flowers and C. calycinum has white flowers. Coleonema belongs in the Rutaceae, the same family as Buchu, Agathosma crenulata , and although coleonemas are sometimes called buchus they are better known as Confetti Bushes, or Cape May. When in flower, bees, butterflies and other insects are attracted to the confetti bush for its nectar and pollen. As the fruit ripens, the seed in each chamber splits along the inner side and through drying and contracting of the inner layer, forcibly ejects the seed. This is known as ballistic dispersal. The seed is dispersed away from the mother plant and collected by ants. Aside from being an attractive garden shrub, the foliage can be used in floral arrangements as a filler. Coleonema pulchellum can be used as an accent plant or in groups to form a hedge or informal border. Use as a filler plant in a mixed fynbos bed with companion plants such as Protea, Leonotis, Metalasia, Felicia, Restio, Euryops, Pelargonium and buchu. Display it in a rockery or grow it as a potplant where it can be pruned to keep it small and neat. Best planted in a sunny position, it requires well-drained soil, compost and a well-balanced fertilizer (3:2:1). Plant out in groups of 3 or 5 with enough space to grow. To retain soil moisture and keep weeds to a minimum, add a layer of mulch. Like other buchus, coleonemas are best planted out during winter and spring. They require good watering in winter and moderate watering in summer. Do not allow plants to dry out and once established they will survive periods of drought. Coleonema pulchellum can be propagated by sowing seed and by taking cuttings. Fresh seed is collected from the previous year's flowers and stored upon ripening. The optimum time for sowing is during autumn. Seed are cleaned and sown on a prepared medium of sand and compost in equal parts in a seed tray. Cover seed with a thin layer of bark and water. Place seed trays in a covered area with good light and ventilation. Keep seed trays damp and germination will take place within 1 to 2 months. Seedlings are pricked out when four true leaves have developed. The growing tips of seedlings are pinched out to encourage bushy growth. Feed buchus regularly with a balanced nutrient. The yellowing of leaves can be treated with an application of iron chelate. Cuttings have the advantage of producing a larger flowering plant quicker than seedlings. Tip cuttings, 50-70 mm, are taken from the current year's growth. Prepare cuttings by making a clean cut below the node and remove a third of the foliage. Best time to process cuttings is during winter and spring. Dip the base of the cutting in a rooting hormone.. Firmly place the cuttings in a medium of 50% bark and 50 % polystyrene. Ideally these cuttings should now be placed in an well-aerated propagation unit with a bottom heat of 24° C. Ideally rooting occurs in 9 to 11 weeks. Carefully pot the rooted cuttings using a well-drained, humus-rich, fynbos potting medium (2 parts leaf mould, 1 part coarse sand). Plants will be ready for planting in 7 to 8 months. Feed regularly with a well-balanced nutrient. Phytophtera cinnamonnii, a soil-borne fungus, attacks the roots of most fynbos species. It prevents the uptake of water causing plants to die. The fungus is most active when the soil temperature is high, especially during summer. Remove infected plants and use soil mulch to reduce the soil temperature. 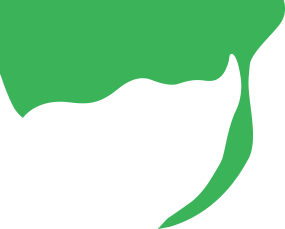 Treat plants with a special fungicide prior to planting out. This is a precautionary measure to control the fungus and to protect adjacent plants. Gold, M. 1992. The buchus. Cultivation and propagation. National Botanical Institute, Kirstenbosch.